Is Norwich Sorting Office heading for 21st Century? YES! Something's afoot at Norwich's Royal Mail sorting office, but we don't know what it is! Mail originating in much of central and eastern Norfolk is usually postmarked in Norwich, using an old Universal machine which has seen better days and rarely seems to have enough ink to make a good impression. If this was from Norwich (it's from Mount Pleasant) we would think it better than normal! This suggests that Norwich's old machine may be retiring at last, and that we will soon have an ink-jet machine. It may be that our customers will know before we do! Do let us know! 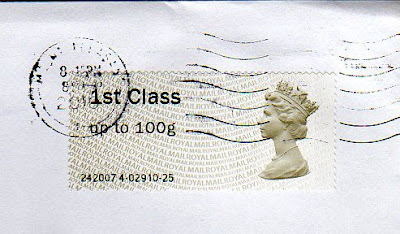 UPDATE: Our customer Stuart confirms that Norwich now has an ink-jet postmark. 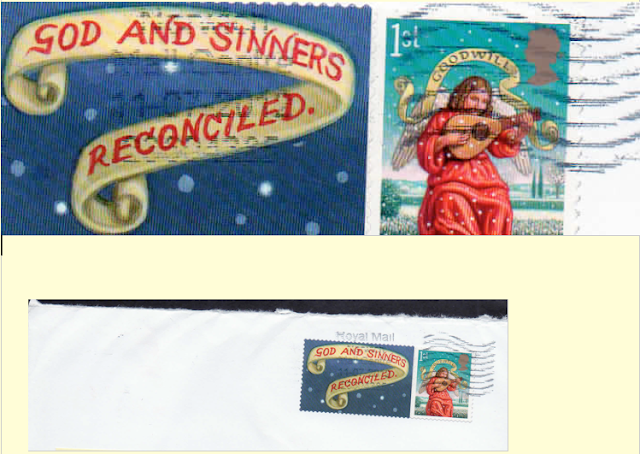 I wish I'd used lighter-coloured stamps! Looks like an iLSM cancel. I confess to not being up to date on all the mail processor machine types. Does this mean you agree with me, or is it one of the new ones? Peterborough has 3 of these machines with tag code idents 410-413 (local numbers 1-3 respectively. The tag code is the upper set of bars. This office has just started using the ink jet printers with the iLSMs. Can check non stamped items for processing on iLSMs - 7th bar from right in tag code will be long(full). First live experiments with ijp were at Jubilee with "Merry Christmas" about 2-3 years ago. Next came 2 boxed versions of "Please Print..." . From Feb 2012, Jubilee and others were using between 1 and 4 thick wavy bars depending on envelope size. This latest version varies the number of bars again on envelope size. PS - the machines have been there for a while but without the ijp. Check the tagcode of items from the area over the last couple of years for full(long) bar as 7th from right. Ijp just started at this office.